Is this a height adjustable desk? Yes, both of our standing desk converter models are height-adjustable. You can select the appropriate ergonomic setup by simply positioning the shelves in the slots provided in the main desk frame. The shelves are simple to reposition with without tools or assitence from others. Which size monitors work with the desks? The Original Well Desk works great with any laptop or LCD monitors up to 22.9″ in physical width. This typically correlates to 24″ monitors (measured diagonally) or smaller. 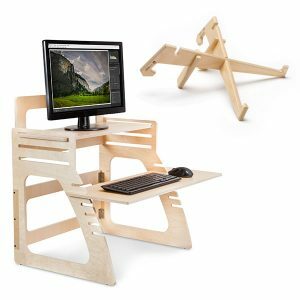 The Dual Monitor Well Desk is a better choice for monitors larger than 24″ (measured diagonally). 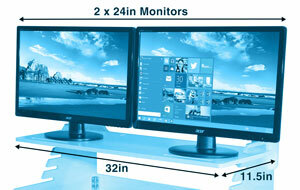 The Dual Monitor Well Desk also works well for two flat screen monitors or smaller. 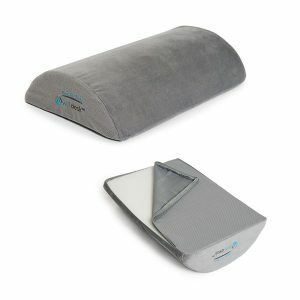 It can also be used with a small monitor and laptop side by side. Where are the desks made? Our desks are proudly made in the USA utilizing American materials and craftsmanship, and the wood is procured from sustainable sources. Each desk is lovingly crafted in Pennsylvania, supporting local industry and jobs. No tools are required! Our Well Desk standing desk converters are made of four solid components and takes only 60 seconds to assemble or disassemble. Each component slides together in a logical sequence with precision fitting slots cut in the wood. You really don’t need instructions to figure this one out. The desk is easy to transport and move around if needed. No, absolutely not. The rear brace adds rigidity and the shelves lock the whole structure into place. The desk is incredibly sturdy and doesn’t shake or wobble — even with heavy monitors or if you are aggressive on the keyboard. It is built to last for years… and it does! The wood itself includes an ultraviolet-cured epoxy acrylate finish to protect against daily wear and tear (Including the acidental coffee spill…) There is nothing about normal daily use that can damage your Well Desk and it supports 35lbs with ease. The footprint of The Original Well Desk is 24” wide by 20” deep and 22” tall. The keyboard shelf is somewhat longer at 30″, extending to either side of the desk frame to provide extra space for your mouse. Both the keyboard and monitor shelves are 11.5” deep. The Baltic Birch plywood that we use in the desk construction is CARB-2 compliant, so formaldehyde emissions are .05 ppm or less before the finish is applied. The ultraviolet-cured epoxy acrylate finish contains no formaldehyde or VOCs. Finishes like this have been shown to reduce the already low emissions from the unfinished panels. The XenStand is proudly made in the USA utilizing American materials and craftsmanship, and the wood is procured from sustainable sources. Each XenStand is lovingly crafted in Pennsylvania, supporting local industry and jobs. While you might be able to use your laptop’s keyboard in the lowest height configuration XenStand, it was really meant to be used with a separate keyboard to ensure proper ergonomics. If you need portability, a small wireless keyboard is the way to go. The Baltic Birch plywood that we use in the XenStand construction is CARB-2 compliant, so formaldehyde emissions are .05 ppm or less before the finish is applied. The ultraviolet-cured epoxy acrylate finish contains no formaldehyde or VOCs. Finishes like this have been shown to reduce the already low emissions from the unfinished panels.